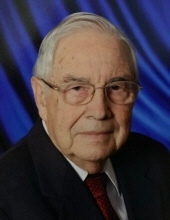 Billy Gene Zeitler passed away Friday, April 12, 2019, in San Angelo, Texas. He was 87 years old. Bill was born on August 3, 1931 in Girvin, Texas to Irvin and Gladys (Elliott) Zeitler. He grew up in Imperial, Texas and graduated from Buena Vista High School. Bill served in the United States Army during the Korean War and was stationed in England. On December 29, 1953, Bill married Lillian Kathryn McKeel and they celebrated 65 happy years of marriage. Bill was preceded in death by his parents, one sister, Selma Eileen Zeitler, and great-grandson, Layton Stone. Among those that will be eager to see him one day in heaven include his wife, Kathy Zeitler of San Angelo; son, Gary Zeitler and wife Patricia of Jacksboro; daughter, Karen Steed of San Angelo; grandchildren Kelli (Zeitler) Stone and husband Mike of Odessa; Elya (Steed) Whitten and husband John of Abilene; Zachary Zeitler and wife Cassie of Jacksboro; Caleb Steed and wife Julie of Hutto; Joshua Steed and wife Stormi of Granbury; Hannah (Steed) Guharajan and husband Deepan of New York; Joanna Steed of Lubbock, and his precious great grandchildren Aubrey, Zoey, Sam, Sara Kathryn, Zaley, Lincoln, Savannah, Elijah, Simon, and one more due in July. Also, sisters Delores (Zeitler) Sharp of Arkansas, and Joy (Zeitler) Swetnam and husband Jerry of Kilgore; brothers Frank Zeitler and wife Mary of Ector, and Irv Zeitler and wife Diane of Paint Rock, numerous nieces, nephews and cherished friends. The family wishes to express their sincere appreciation to Baptist Retirement Community and the Sagecrest Facility for their love, support, and care. Visitation will be held from 4:00-6:00 PM on Monday, April 15th at Harper Funeral Home in San Angelo. Interment will be at 10:00 AM in Abilene, Texas on Tuesday, April 16th at National Cemetery. A celebration of his life will be held at Southland Baptist Church in San Angelo on Tuesday, April 16th at 3:30 PM. Grandsons will serve as Pall Bearers. "Email Address" would like to share the life celebration of Billy Gene Zeitler. Click on the "link" to go to share a favorite memory or leave a condolence message for the family.